Any computer with a PDF reader which allows you to print from it. 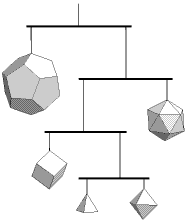 we also have some polyhedral models to aid in Bell ringing. Some of these models are stellations of polyhedra, Click here for an explanation of how this is done. Click here for instructions to make a Christmas Tree decoration from a stellated octahedron. We first had these on display at the Wakefield Show 2001.